I just purchased a UD6950, I am running Windows 10 Enterprise version 1803. My laptop is a Dell Precision M3800. I am using my laptop display and 2 27" Planar 1080 displays. The displays can accept DisplayPort or HDMI. I can only ever get one of the 27" displays to work at a time. 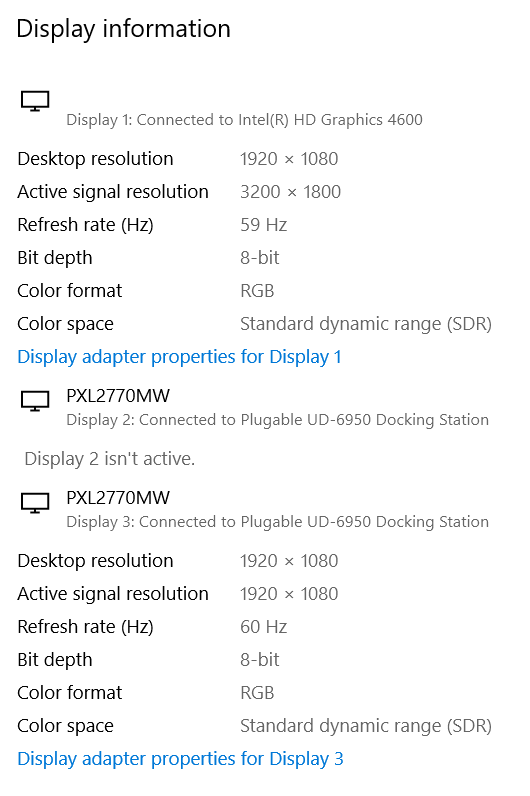 I have tried swapping cables, switching to a DisplayPort to HDMI cable, moving the DisplayPort connections on the docking station. It seems like the bottom DisplayPort connection is the one that does not work. The display setting on the computer sees the third display but says it is not available. Thank you for testing and providing these additional details. Based on your description of the behavior, our first step is to get some additional information from your system to help narrow down this issue. If you would, please keep the dock connected and both monitors attached (even though one is not working) and attach the output of our diagnostic utility PlugDebug ( http://plugable.com/support/plugdebug ) to an email to ‘support@plugable.com’ with the subject line ‘Ticket #269344 - Attention Pat’ as this will allow us to examine some log files from your system to help determine the next steps. Disconnect the dock from the system and please remove the power cable from the dock so it turns off completely (this is important so the unit resets). Please keep it disconnected until the last step. Reattach the power cable to the dock first. Once the dock is powered on, reconnect it to your system. If the device is not detected, please reboot the system. Please let us know if that helps get things working how they should, and we’ll go from there. I followed your instructions, exactly, but the issue remains. I ran Plug debug again but it wont let me attach the file here. if it makes any difference, this is what comes up in the display settings. Select the inactive display from the diagram at the top of the window ( should be grey ), if you are unsure which display is which please use the Identify button to help map the physical displays to the diagram. Just to confirm, even with the top port on the docking station disconnected either monitor connected to the bottom port will not display anything? WooHoo! Selecting the inactive display worked! I had tried that a number of times before and it never changed. That’s great! Just to confirm, is this now working with both displays? We’re closing this thread due to inactivity, but if you have any further questions please feel free to contact support@plugable.com and we’ll be happy to help.